What can an Audio Engineer do for you? As an Audio Engineer I am concerned with anything to do with the recording, mixing and reproduction of sound. Audio Engineering can be described as the "The technical aspect of recording or reproducing live sound”. The physical recording of any audio project is done by an Audio Engineer. 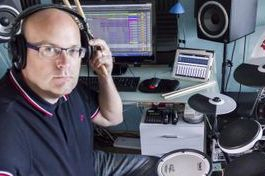 I am experienced in the use of Pro Tools, Ableton Live, public address systems, live band rigs, stage monitoring systems, fold-back mixing, IEM (In-Ear Monitoring). FOH (Front of House), DI-Boxes, (DAW) Digital Audio Workstations, home studios, analogue mixing desks, channel strips, MP3, WAV, Mastering, finalizing, microphone techniques, track equalization, compression, room acoustics, pre-amplifiers, outboard gear, mixer levels, line levels and general audio systems. A variety of terms are used to describe Audio Engineers who operate or install sound recording, sound reinforcement, or sound broadcasting equipment, including large and small format consoles. Terms such as "Audio Technician", "Sound Technician", "Audio Technologist", "Recording Engineer", "Sound Mixer" and "Sound Engineer" are often included within this definition. Additionally, the term Audio Engineer can refer to a scientist or engineer who develops new audio technologies working within the field of acoustical engineering.